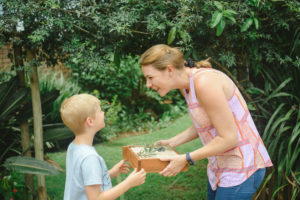 First of all, tie a knot somewhere to remind you that it is Mother's Day on Sunday, 14 May, and remember that your local GCA garden centre will be stocked to the rafters with the prettiest gift ideas to make all moms smile! While you're there, spoil yourself (and your garden) with seasonal colour and smart plants. When adding new plants to your garden this month, think about plants which have become icons for a reason, so that you are in the 'royal circle' of gardening too! Heavenly bamboo (Nandina domestica) is the heavenliest, ‘fake bamboo’ available! In large pots, they mean ‘good luck’ at your front door. They are the ‘zen’ in Zen gardens. You can plant them in a row in a narrow space, with its changing sun and shade patterns between the house and a boundary wall. They will soon supply a lacy look with their rust-tinted leaves, and supply height with their tall-growing branches, giving you much-needed privacy. The bright red berries they produce, will delight you during winter. Also plant a few of its dwarf cousin (Nandina pygmaea), to create fiery foliage balls with bright autumn colours all over - good for sun or light shade. Both are cold-hardy and waterwise. Ravishing roses: GCA nurseries across the country list the following rose hybrids as their top sellers: 'Iceberg', 'Double Delight', 'Candy Stripe', 'Blue Moon', 'Satchmo' and 'Bride's Dream'. As their current stock of these varieties will have had a full summer season of growth behind them, it makes sense to plant them now. This will give them time to settle in over winter and by October, you should be showered in blooms! 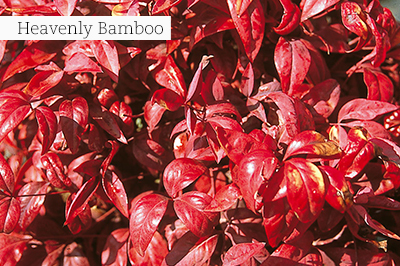 Colourful from morning until dusk in all seasons: Two compact mirror bushes called Coprosma Pacific 'Sunset' and Coprosma Pacific 'Sunrise' can set your garden alight with colour. 'Sunset' has glossy wave-shaped leaves with a vivid red centre, set against a burgundy/chocolate brown margin. 'Sunrise' has chocolate brown foliage with hot-pink highlights. The colours of both intensify immensely in cooler months. Use them as striking container plants, as low hedging or for colouring in those shrub beds in low to moderate watering zones. Water at least once a week. If you have planted annuals amongst the roses and your automatic irrigation system is set on more regular watering cycles, if it is fine to leave it so. Fertilising is not needed now, except in subtropical areas like the Lowveld and coastal areas of KZN where roses will still go on flowering as usual. Keep on spraying against fungal infections like black spot, mildews and rust which are much more active in cooler weather. Aphids can still be problematic and more difficult to destroy in summer, seemingly due to higher sugar levels in the plant cells, which attracts them. Use systemic insecticides as sprays, or drench the soil around each bush with a systemic insecticide which is recommended to combat these pests effectively and for longer. Petunia 'Queen Of Hearts' has a semi-trailing growth habit and large, loud flowers decorated with contrasting stripes. Perfect for eye-catching hanging baskets. 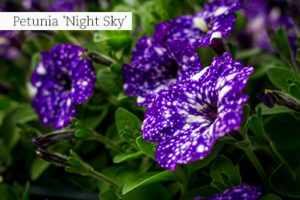 Petunia 'Night Sky' boldly goes where no other petunia has gone before. The flowers, in dark purple with blue tones and glittered with white markings, give the impression that the plants have been dusted by stardust. Osteospermum 'Blue Eyed Beauty' looks like it has been socked right in the centre of its typical happy African daisy face. The bright yellow petals offset the blue-rimmed circle beautifully. Nemesia Nesia 'Burgundy' can be called on to create an extremely floral border in any bed. This plant of South African origin has been bred into a compact plant which smothers itself in wine red flowers. All nemesias in the Nesia range simply deserve to be planted in the garden and in pots! Nodding poppies - the more you pick, the more flowers you'll get! Iceland poppies (Papaver naudicale) are the graceful queens of late winter and spring as both garden and cut flowers. The best way to enjoy their beauty, is to plant them as a bold border which receives full sun. Grow them in well-draining, slightly alkaline soil and space them about 30cm apart. For a winter wonderland effect, interplant your poppy seedlings with pretty daffodil bulbs - there is still time to plant them! Do not overwater poppies, and protect them with cutworm bait. Two good varieties to choose from are 'Champagne Bubbles' and 'Artist Glory' mixed. California poppies (Escholtzia 'Mission Bells') is another favourite which can tolerate poor, sandy soil and dry spells. They start flowering in September with a main flush in October. The silky flowers are not perfect for the vase, but are edible and add zing to salads. Eating flowers has become high fashion, so plant English daisies, pansies and violas, as well as dianthus, with their spicy perfume in pots, window boxes and hanging baskets. Add in some cool season herbs such as oregano, rocket, coriander, thyme and parsley as companions. Eat them all with pride and brag about them with gusto! Moth orchids (Phalaenopsis) are always available in bloom, and stay that way for months on end. If displayed in smart cover pots, you will have the pleasure of their floral company and elegance throughout winter. 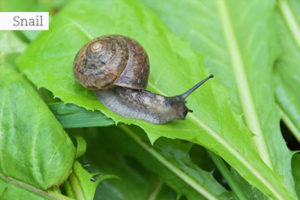 Snails will be looking for places to overwinter. Clean up under containers and clumps of perennials where they will huddle together, and put out fresh bait amongst young veggie seedlings. Frost hardy and water wise: Dogwood (Rhamnus prinoides) can be trained into a small tree with shiny dark green leaves. The flowers are small and greenish yellow and are followed by round berries that ripen to red, purple and then black. It’s a great evergreen choice for small gardens, without an aggressive root system. Dogwoods can also be planted and clipped into a hedge and don't mind a little shade. Best seller for temperate and subtropical climes: Leopard tree (Caesalpinia ferrea) is a slender semi-deciduous tree, with smooth bark which exfoliates easily but incompletely, often leaving dark brown patches against a light background. It provides light shade, which makes it ideal to plant on the lawn. Create a mini forest with a few planted together as a focal point. Perfect for bird gardens: Fever tree (Vachellia xanthophloea) is an attractive, semi-deciduous indigenous tree and has an open, to spreading crown which is sparsely foliated. The characteristic lime green to greenish-yellow bark is smooth and slightly flakey. Bright yellow to golden, ball-like flowers which are sweetly scented are borne in clusters. It has a fast growth rate, but should not be planted near houses, swimming pools or underground pipes. It will flourish in subtropical to temperate climates and will tolerate light frost once well established. Shade netting - greenhouse shade cloth is manufactured from knitted polyethylene fabric that does not rot, mildew or become brittle. It is available in multiple shade densities and helps to protect plants like vegetables from direct sunlight, and to reflect heat to keep them cooler. 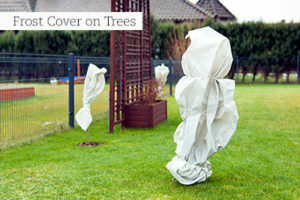 Frost cover - frost cloth is an extremely light, breathable fabric used to protect tender plants against frost. Weed matting - is a strong and durable woven fabric to use effectively around plants to prevent weeds. The fabric allows air and water to flow through, while slowing down evaporation and thus keeping the soil moist and cool for longer. As soon as dahlias have died down completely, they can be lifted, cleaned up, dusted with a fungicide powder and stored. Water newly planted bulbs deeply every four days - they should never dry out completely. Those in pots will need more regular watering. You can still plant all spring-flowering bulbs. Sow some wild grass seed somewhere in your garden to encourage birds in winter. These seed mixes are available in seed packets at most outlets selling flower and vegetable seed. 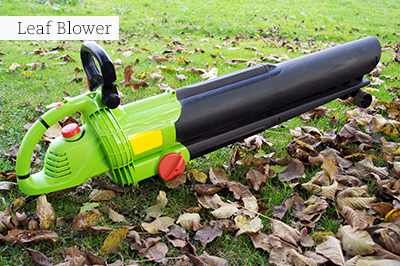 Invest in a leaf-blower to collect all the last fallen autumn leaves from hard surfaces, like paving and driveways. Use them as light layers of mulch around plants, to add in thin layers to your compost heap, or to make leaf mould, by stacking them in plastic bags to rot down. Hellebores, those old stalwarts in cold gardens, will be sprouting new foliage so you can remove the old, tatty leaves and give them a fresh layer of compost. They will soon be in flower. If your shady areas look dull, brighten them up with Plectranthus ‘Mona Lavender’, as well as perennial and bedding begonias. Start putting out your frost cover - by the time June arrives, hardy frost is on the cards. Doll up large patio containers with Calamondin (miniature orange) trees under planted with oriental veggies like Mizuna, Pakchoi and Tatsoi and a herb like thyme, (all available in trays or pots at your nursery). Add splashes of edible winter colour in the form of calendula. 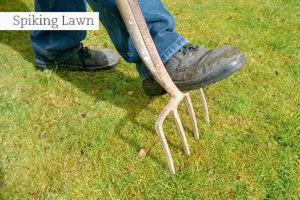 Lawn tip: To improve drainage in lawns before the heavy winter rains in the Cape, spike deep holes with a sharp garden fork all over the lawn. 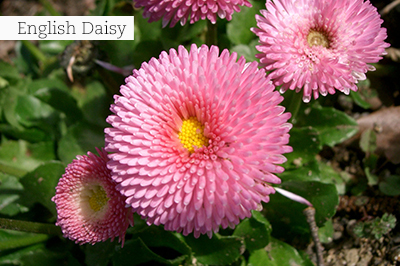 Fill in the holes by brushing in sharp river sand or old potting soil. Supply a dressing of bonemeal or superphosphate to improve root growth (don’t use bonemeal if you have dogs). Now is also a good time to lay instant lawn sods or to overseed damaged areas. If your plants are not doing well it is probably due to poor soil. Invest in a bulk load of compost to add to all planting areas. Do not dig it in, just spread it out on the surface to be gently worked in by micro-organisms. Keep thick layers of compost away from the main stems of plants, as it can cause rotting. Bulk composting should be done twice a year - in autumn and spring, to have ideal soil.